The Croswell is located at 129 E. Maumee St. in downtown Adrian, Michigan. From Toledo: Take U.S. 23 north into Michigan and get off on Exit 5. At exit 5, head north on U.S. 223 (you’ll need to go around a pair of roundabouts). Travel approximately 9 miles to Blissfield. Continue through Blissfield, then travel about 10 miles to Adrian. You will pass Meijer and Buffalo Wild Wings on the right. Turn right on Main Street / M-52. Follow Main Street for about 1.6 miles until you reach downtown Adrian. 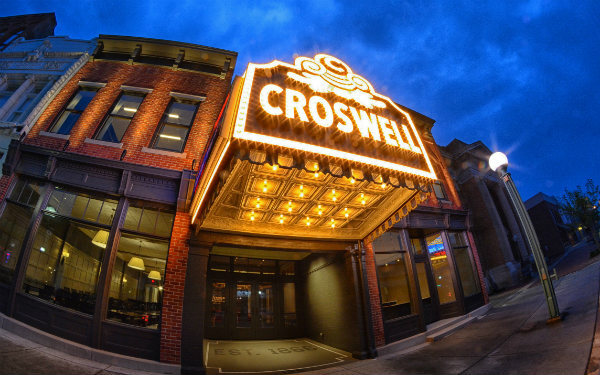 Turn right on Maumee Street, and the Croswell will be on your left. From Ann Arbor: Take U.S. 12 west toward Saline. From Saline, travel about 14 miles to M-52 (you’ll go through Clinton a few miles before M-52). Turn left on M-52 and travel about 13 miles to Adrian. M-52 becomes Main Street; once you get downtown, turn left on Maumee Street, and the Croswell will be on your left. From Fulton County, Ohio: Take OH-109 north toward Michigan. OH-109 becomes M-52 at the state line. From the state line, travel about 12 miles to Adrian. Continue through the intersection with U.S. 223. M-52 becomes Main Street; once you get downtown, turn right on Maumee Street, and the Croswell will be on your left. Free parking is available on the street in front of the Croswell, as well as in several city parking lots behind the theater. The parking lots behind the Croswell can be accessed via Toledo Street.